And Maglor answered: 'If it be truly the Silmaril which we saw cast into the sea that rises again by the power of the Valar, then let us be glad; for its glory is seen now by many, and is yet secure from all evil.' Then the Elves looked up, and despaired no longer; but Morgoth was filled with doubt. This is the image of the Silmaril with which we are most familiar from The Lord of the Rings. For in the Third Age the evils that once swirled around the Silmarils are long past, and the one remaining jewel is a sign of hope, even for the Elves who remember the sorrows of the First Age. Far above the Ephel Dúath in the West the night-sky was still dim and pale. There, peeping among the cloud-wrack above a dark tor high up in the mountains, Sam saw a white star twinkle for a while. The beauty of it smote his heart, as he looked up out of the forsaken land, and hope returned to him. For like a shaft, clear and cold, the thought pierced him that in the end the Shadow was only a small and passing thing: there was light and high beauty for ever beyond its reach. His song in the Tower had been defiance rather than hope; for then he was thinking of himself. Now, for a moment, his own fate, and even his master's, ceased to trouble him. He crawled back into the brambles and laid himself by Frodo's side, and putting away all fear he cast himself into a deep untroubled sleep. Though more than six thousand years separate them, both Maglor and Sam understand that this Silmaril is 'secure from evil' and 'far beyond [the Shadow's] reach.' It is this removal that allows its transformation into so potent a symbol of hope, as the evils attendant upon the continuing attempts of the sons of Fëanor to fulfill their oath amply demonstrate. Moreover, the loss of the other two Silmarils in the sea and the earth balance the elevation of the first into the heavens, an outcome which in its context has more than a hint about it of something that was meant to be: 'And thus it came to pass that the Silmarils found their long homes: one in the airs of heaven, and one in the fires of the heart of the world, and one in the deep waters' (Silm 254). Tolkien's wording here is of interest, as it so often is. He calls the sky, the earth, and the sea, the 'long homes' of the jewels. 'Homes' of course tell us that they belong there, but the phrase 'long homes' evokes an image of the grave: 'because man goeth to his long home, and the mourners go about the streets' (Ecclesiastes 12:5 KJV). But this phrase, especially as Tolkien uses it in The Silmarillion, alludes not just to the grave, but to a home removed forever from the evils of this world in which 'all is vanity,' as the final, far more famous summation of Ecclesiastes 12 proclaims. For the Silmarils were from their creation like the stars themselves -- 'even in the darkness of the deepest treasury the Silmarils of their own radiance shone like the stars of Varda' (Silm. 67) -- and 'Mandos foretold that the fates of Arda, earth, sea, and air, lay locked within them' (Silm. 67). Note the corresponding references to earth, sea, and air here and in the 'long homes' of the Silmarils quoted above. Indeed The Silmarillion even suggests that 'some shadow of foreknowledge came to [Fëanor] of the doom that drew near; and he pondered how the light of the Trees, the glory of the Blessed Realm, might be preserved imperishable' (Silm. 67). for though at great feasts Fëanor would wear them, blazing on his brow, at other times they were guarded close, locked in the deep chambers of his hoard in Tirion. For Fëanor began to love the Silmarils with a greedy love, and grudged the sight of them to all save to his father and his seven sons; he seldom remembered now that the light within them was not his own. The reaction of Melkor to the Silmarils was not dissimilar. He lusted for them, 'and the very memory of their radiance was a gnawing fire in his heart' (67). Just as he had once wished to possess the Light 'for himself alone' (31), and fell when he could not have it, so now, once he has succeeded in stealing them with Ungoliant's aid, he refuses to let her even see them, and 'name[s] them to [him]self for ever' (80). We need only recall that he, too, wore them, 'blazing on his brow', in the 'deep chambers' of Angband, which he never left but once before his final overthrow. In Melkor's hands, as in Fëanor's, the situation of the Silmarils is precisely the opposite of what Sam and Maglor witness: the glory of the Silmarils is seen by only a few. Yet it is the evil of Fëanor's greedy love and Melkor's lust that make it possible for the Silmarils to become the greatest symbols of hope in Middle-earth. The evil is a felix culpa, through which Ilúvatar brings into being 'things more wonderful' and 'beauty not before conceived' (Silm. 17, 98). Three passages, all of which recount similar moments, illuminate this transformation. In the first Fingon has come to Thangorodrim to rescue Maedhros. Though the sight of Morgoth's realm leaves Fingon 'in despair', 'in defiance of the Orcs...he...sang a song of Valinor that the Noldor made of old' (Silm. 110). But Maedhros, whom Morgoth has hung from an inaccessible precipice far above, hears Fingon and sings back to him, revealing his location. Yet he remains in the grasp of evil beyond Fingon's reach. '[B]eing in anguish without hope' Maedhros asks Fingon to kill him with his bow; Fingon, 'seeing no better hope' prays to Manwë to guide his arrow. 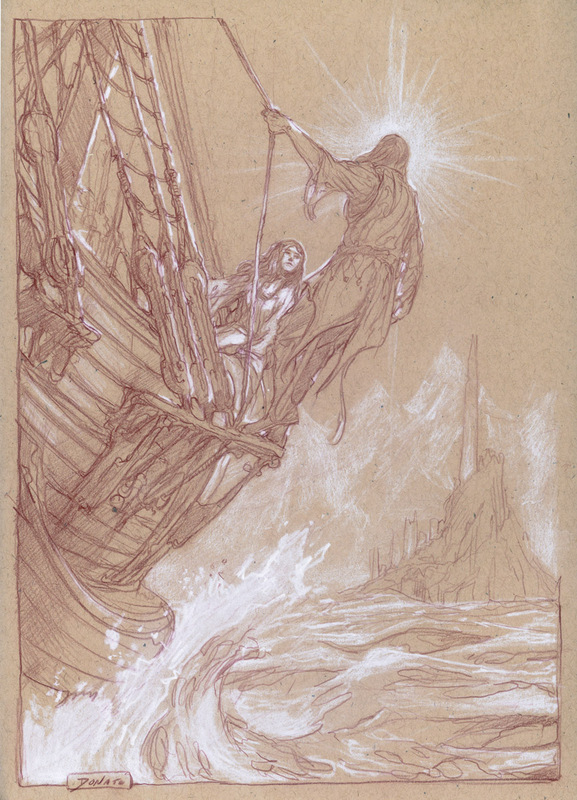 That Manwë responds by dispatching one of his eagles to help Fingon to rescue Maedhros -- though not without the sacrifice of his hand -- is inspiring and gratifying to reader and characters alike, but it also underscores the hopelessness of the Elves' unaided struggle to regain possession of the Silmarils. For the strength of Morgoth is such that 'no power of the Noldor would ever overthrow' it, as Fëanor himself saw 'with the foreknowledge of death' when he looked upon the towers of Thangorodrim (Silm. 107). Ulmo's later words to Turgon, moreover, may be seen to offer commentary on the truth of this scene, if not on the scene itself. They allude to the lessons history offered -- the Silmarils, Fëanor's 'greedy love' for them, and the reckless, vengeful oath -- as well as prophesying that 'true hope' was something from beyond Middle-earth: 'love not too well the work of thy hands and the devices of thy heart; and remember that the true hope of the Noldor lieth in the West and cometh from the Sea' (Silm. 125). And, of course, the hope to which Ulmo alludes is the hope with which we began this essay, that embodied by Eärendil and his Silmaril. 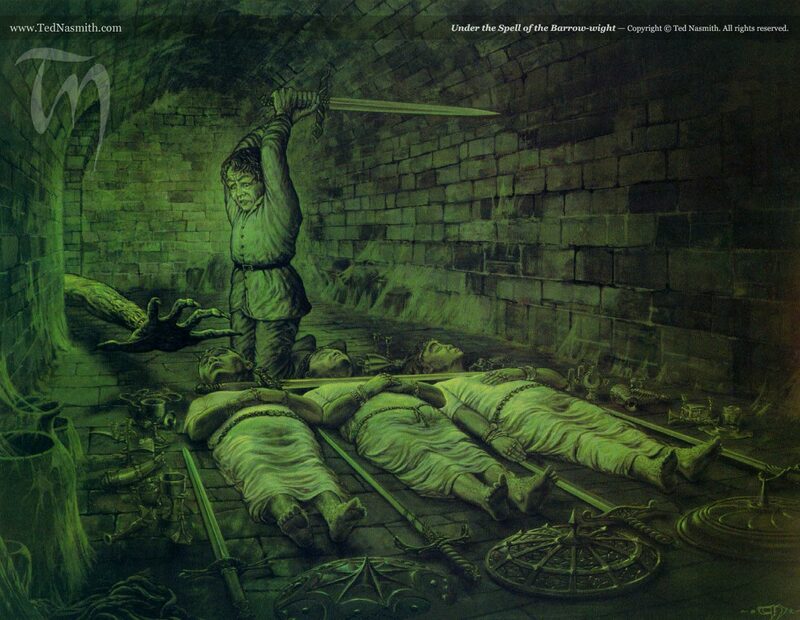 In the second passage Beren lies imprisoned in Sauron's dungeon. Finrod has lost his contest of song against Sauron, and died saving Beren from a wolf. In that hour Lúthien came, and standing upon the bridge that led to Sauron's isle she sang a song that no walls of stone could hinder. 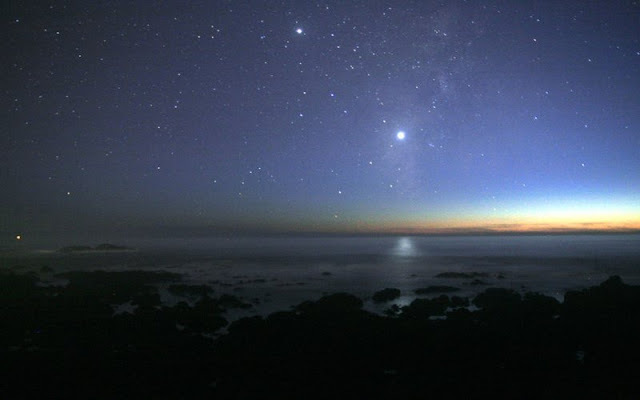 Beren heard, and he thought that he dreamed; for the stars shone above him, and in the trees nightingales were singing. And in answer he sang a song of challenge that he had made in praise of the Seven Stars, the Sickle of the Valar that Varda hung above the North as a sign for the fall of Morgoth. Then all strength left him and he fell down into darkness. Finrod's defeat and death show once again that the solitary power of the Elves is insufficient to defeat the evil they face. Yet Sauron, who defeated Finrod by turning his song against him, does not contest the strength of Lúthien in songs of enchantment. Indeed the effect of her first song should remind us of Finrod's: hers leads Beren to see the stars shining and hear birds singing in the darkness of his prison cell, just as his conjured the sounds of birdsong in Nargothrond and of the sea sighing in Elvenhome (Silm. 171). Beren then defiantly sings a song of his own that invokes the promise of the Sickle of the Valar, a constellation set in the heavens by Varda as 'a sign of doom' for Morgoth (Silm. 48). But Lúthien's second song shakes the entire island Sauron's tower stands upon. It also makes clear to Sauron that he is facing Lúthien, who is 'the daughter of Melian', and the power of whose song is famous, and he adopts a different strategy. Yet this also fails because Huan, the Hound of Valinor, is superior to all his strengths, whether gross or subtle (Silm. 175). Sauron is vanquished and Lúthien's third song brings down the tower and sets Beren free. Almost every factor that gives hope against evil points beyond the sea to Valinor, to the Valar and Maiar rather than to the Elves. But with Beren, the mortal, new elements are introduced. For 'a great doom lay upon him' (Silm. 165), which leads him and Lúthien first to confront Sauron here and then Morgoth himself in Angband, where they win the Silmaril that their grand-daughter, Elwing gives to her husband, Eärendil. Until then, his attempts to reach Valinor to plead for help have been in vain, despite the fact he can speak for both Elves and Men, for those whose fate lies entirely within Arda and those whose fate lies beyond it. With it, he can pierce the veils that prevent anyone from reaching Valinor, to find that the Valar have been waiting for him. He is 'the looked for that cometh at unawares, the longed for that cometh beyond hope' (Silm. 248-49), to which Ulmo adds: 'for this he was born into the world' (249). Just as Beren's doom allowed him to enter enchantment shrouded Doriath and then to achieve his quest to win a Silmaril, so Eärendil's fate drives him, by means of that same Silmaril, to reach hidden Valinor and achieve the hopes of Elves, Men, and Valar. Equally both of them must also pay a price: Beren loses his hand and his life, and Eärendil any possibility of ever returning to mortal lands. And the price they pay exceeds that which Maedhros paid because they are buying something far more precious, the hope that jealous possession of the Silmarils denies, whether it is moved by Melkor's lust or Fëanor's greedy love. In the final passage Sam discovers the captive Frodo by singing in the tower of Cirith Ungol, just as Fingon had found Maedhros (RK 6.i.908-909). We have already seen this moment alluded to by Sam when a glimpse of Eärendil's star revealed to him that '[h]is song in the Tower had been defiance rather than hope; for then he was thinking of himself. '** In this he was like Fingon at Thangorodrim, who sang in defiance of the orcs with no other purpose. Unlike Fingon, however, the song Sam sings is not one he knows of old or one that was written by another. Rather 'words of his own came unbidden to fit the simple tune' (RK 6.1.908). Yet, while Sam's defiant singing recalls Fingon's within the larger context of the legendarium, within the context of that part of the tale in which he finds himself his sudden inspiration recalls and contrasts his and Frodo's experiences crying out to Eärendil and Elbereth in their struggle against Shelob. Seldom had he remembered it on the road, until they came to Morgul Vale, and never had he used it for fear of its revealing light. Aiya Eärendil Elenion Ancalima! he cried, and knew not what he had spoken; for it seemed that another voice spoke through his, clear, untroubled by the foul air of the pit. Sam's words and language in the tower are by contrast his own, and yet they come 'unbidden' by him. Given the inspired invocations of Elbereth and Eärendil we have just seen, some kind of external inspiration seems at work here, too. The light of the Silmaril, both in the star of Eärendil and captured in the phial of Galadriel, is indeed 'a light when all other lights go out'. It illuminates this part of Frodo and Sam's tale, from the moment on the stairs when they discuss the Tale of Beren and Lúthien and Sam makes the connection between it and the light of the star in the glass (TT 4.viii.712) until the moment when Sam sees the star itself (RK 6.ii.922). It repeatedly aids and inspires them to see beyond the darkness in which they find themselves otherwise nearly helpless. It is, as it were, a physical manifestation of that Power which speaks through them in a voice not their own and a language unknown to them, bringing them essential help from a world beyond their own. And looking out from the slopes of Ered Wethrin with his last sight he beheld far off the peaks of Thangorodrim, mightiest of the towers of Middle-earth, and knew with the foreknowledge of death that no power of the Noldor would ever overthrow them; but he cursed the name of Morgoth thrice, and laid it upon his sons to hold to their oath, and to avenge their father. The Silmaril risen into the heavens reflects what Fëanor could have been, 'like' -- to borrow a phrase not without relevance -- 'a glass filled with a clear light for eyes to see that can' (FR 2.i.223). A remark made by the narrator of The Silmarillion is also of the greatest significance here: 'it may be that [Fëanor's] after deeds would have been other than they were', had he agreed to unlock the Silmarils so that Yavanna might thereby resuscitate the Two Trees (Silm. 79). For Fëanor would have had to renounce selfish possession of the Jewels, abandoning his 'greedy love' of them for ever, for the good of others. As a result, we might almost describe them with the words of Maglor upon seeing the star rise for the first time and recognizing it for what it must be: 'its glory is seen now by many, and is yet secure from all evil' (Silm. 250). The same, of course, could be argued for Morgoth. As we saw above, Mandos had prophesied that 'the fates of Arda ... lay locked' within the Jewels. The plural points to multiple possibilities, to good as well as evil, and here we have seen that the Silmarils, possessed or lusted after, led both Elves and Valar on to evil, but, once removed, led on to hope and the promise of deliverance from an evil that is ultimately transitory. Ilúvatar has brought forth still greater wonders, transforming the beauty of the Silmarils, terrible in its consequences when viewed selfishly, into the single most outstanding symbol of hope in Middle-earth. Moreover, given Tolkien's identification of his Eärendil with Earendel in the poem Christ, whom Anglo-Saxons identified with John the Baptist,*** we may also see Eärendil as one who 'prepares the way of the Lord', though at a far greater remove than John the Baptist or any prophetic figure of the Old Testament. The salvation that Eärendil makes possible because, having two natures, he can speak for both Elves and Men, is by no means the same as the redemption that Christ, with his two natures, can enact. But the two resonate with each other, and thereby Tolkien evokes the intervention of the One in the woes of this world, an intervention necessarily foreseen since Middle-earth is our world. ** The citation of this passage at RK App. A 1035 n. 5 shows that the star Sam sees is in fact the star of Eärendil. *** I refer of course to the famous lines 'Éala Éarendel, engla beorhtast / ofer middangeard monnum sended' (Christ 1.104-05). The Blicking Homilies refer to John the Baptist as 'se níwa éorendel', 'the new Earendel.' One wonders how much influence that word 'new' had on Tolkien's thinking. "Strider" I am to one fat man who lives within a day's march of foes that would freeze his heart or lay his little town in ruin, if he were not guarded ceaselessly. While the identity of these foes has never been clear, that was hardly the point. Strider was speaking about the effect such foes would have on the North were it not for the Dúnedain, whose unknown efforts get repaid with scorn. Still I have from time to time wondered who or what he's talking about. If an author creates the illusion of depth, that very act invites us to embrace the perspective and inquire. Of course that doesn't mean we'll find an answer, or even that there is one. Tolkien himself, for example, could only speculate about what happened to the Entwives (Letters, nos. 144 and 338), a question which far more people would like answered. But a clue nearby in the text and a passage in the first draft are suggestive about who were the 'foes that would freeze [Butterbur's] heart.' Just a moment earlier Strider had said: 'when dark things come from the houseless hills, or creep from sunless woods, they fly from us.' The use of the definite article before 'houseless hills' and its absence before 'sunless woods' suggests he has specific 'houseless hills' in mind. The phrase is in itself evocative, both raising and rejecting the idea that the hills are inhabited. It also rather nicely suits the Barrow-downs, which are inhabited and not by creatures that are alive and not, and which are easily within a day's journey of Bree. This immediately invites us to ask whether barrow-wights can leave their barrows. 'Necromancy' will suggest something of the horrible association of this word. I think that what is here meant is that terrible northern imagination to which I have ventured to give the name 'barrow-wights'. The 'undead'. Those dreadful creatures that inhabit tombs and mounds, They are not living: they have left humanity, but they are 'undead'. With superhuman strength and malice they can strangle men and rend them. Glámr in the story of Grettir the Strong is a well known example. Tolkien's phrasing at the end is intriguing since he does not call the tale 'Grettis saga' or even 'the saga of Grettir the Strong', but 'the story of of Grettir the Strong', which is precisely what William Morris and Eiríkir Magnússon entitled their translation of it. Tolkien owned this translation as well as many other works by Morris, which he admitted were an influence on him and which he sometimes read to his children (Hammond and Scull  2.599-601). More than that he also at times dealt with them on a professional level (Hammond and Scull  2.603-04). Morris, moreover, uses the very odd and unusual word 'wraithlings' to describe a creature such as Glámr has become (chapter 33). This word, which translates ON smávofur, literally 'little ghost' -- in the saga it is used contemptuously by a character who presently learns the error of false pride -- is unknown to the first edition of the OED and Google Ngram finds no trace of it between 1500 and 2000. Since it is so very rare, possibly even hapax legomenon, we may well wonder if it is the source from which Tolkien derived the notion he briefly entertained that the Ringwraiths were barrow-wights on horseback (Shadow 75, 118-120). However much it may look like Tolkien still had the barrow-wights in mind when he wrote the words with which we began this inquiry, it remains difficult to say if this is so. We must be cautious in the way we treat details that come from texts written before or after the published text. Tolkien was always rethinking what he wrote, and that should give us pause. This is especially the case with things written later, like the shifting conceptions of Galadriel, who did not exist before the tale reached Lothlórien, but whose history emerged and evolved in the two decades The Lord of the Rings's appearance and Tolkien's death. Yet we should not be too quick to dismiss what he had written, especially in a draft, and regard possible links to it as something that Tolkien forgot to delete. Surely some of what appears in the drafts, but was not included in the final text, may help to create the illusion of depth for which Tolkien is so justly famous. The comradeship of poetry and war is one of the most ancient relationships humanity knows. They have served together on the plains of windy Troy and walked eye deep in the hell of the Somme. Sometimes it is all thrill and glory, sometimes horror and shame, sometimes the hypocrisy of promoting the first and pretending the second doesn't exist, or worse, doesn't matter. Having read a lot of Homer and a lot of history, and having been a young fool once held captive by the romance of the Lost Generation, I long ago found myself drawn to the cataclysm of the Great War and the brilliance of its poets. From them I learned, in a way that only illuminated Homer, of the kaleidoscope of terror, disgust, and mad valor that people know in war. So I often read the WWI poets and wonder what it must have been like for them to go off to war, young men with heads full of Homer. Did it defend them, at least at first, from the shattering reality of dismemberment and death? Did it lead to a greater disillusionment if that defense failed? And for those who did not 'lose the day of their homecoming', as Homer would have said, what about looking back years later? Did it help them come to an understanding they could live with? And what did it take and what did it mean for them to talk about it? Did the ghosts of who they were have to drink the blood again in order to speak once more, as the shades Odysseus meets in the underworld do (Odyssey XI.100ff, Fagles)? The war itself has been so often described by those who saw more of it than I that I shall here say little about it. 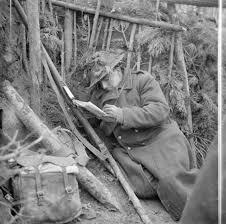 Until the great German attack came in the Spring we had a pretty quiet time. Even then they attacked not us but the Canadians on our right, merely "keeping us quiet" by pouring shells into our line about three a minute all day. I think it was that day I noticed how a greater terror overcomes a less: a mouse that I met (and a poor shivering mouse it was, as I was a poor shivering man) made no attempt to run from me. Through the winter, weariness and water were our chief enemies. I have gone to sleep marching and woken again and found myself marching still. One walked in the trenches in thigh gum boots with water above the knee; one remem­bers the icy stream welling up inside the boot when you punctured it on concealed barbed wire. Familiarity both with the very old and the very recent dead confirmed that view of corpses which had been formed the moment I saw my dead mother. I came to know and pity and reverence the ordinary man: particularly dear Sergeant Ayres, who was (I suppose) killed by the same shell that wounded me. I was a futile officer (they gave commissions too easily then), a pup­pet moved about by him, and he turned this ridiculous and painful relation into something beautiful, became to me al­most like a father. But for the rest, the war—the frights, the cold, the smell of H.E., the horribly smashed men still moving like half-crushed beetles, the sitting or standing corpses, the landscape of sheer earth without a blade of grass, the boots worn day and night till they seemed to grow to your feet - all this shows rarely and faintly in memory. It is too cut off from the rest of my experience and often seems to have hap­pened to someone else. It is even in a way unimportant. One imaginative moment seems now to matter more than the real­ities that followed. It was the first bullet I heard—so far from me that it "whined" like a journalist's or a peacetime poet's bullet. At that moment there was something not exactly like fear, much less like indifference: a little quavering signal that said, "This is War. This is what Homer wrote about." All Lewis' understatement -- a shell every twenty seconds all day is not an attack, the discomfort of the leaking boots -- all his nonchalance -- the zombielike marching, the parenthetical 'I suppose' -- all his modest impotence -- 'futile', 'puppet' -- can, I think, lead the unwary into misapprehending his final statement. Which is not glib. It all turns upon 'quavering': the 'imaginative moment' hangs trembling between 'fear' and 'indifference', but is much closer to fear, an experience he can process only by means of his education. Yet he places War, with a capital W, first, as it came home to him in this moment, and Homer second. The emphasis is on War; Homer is the imaginative tool that was at hand. He's connecting Homer to the primary reality of War, not War to the secondary reality of Homer. I would be interested, on a very personal level, to know if this was all Lewis felt as this thought came to him with the 'whine' of the first bullet. If I could ask him only one perfectly impudent question, it would be about this moment. For, while I have not been to war, thank God, I once had someone who had been shot lie bleeding in my arms. He was a young man I barely knew who was shot by another young man I barely knew as the result of a profoundly stupid argument. He died not long after we reached the hospital. As I sat in the emergency room and looked at all his blood all over me, I could think only of Lady Macbeth. Even now, just as Lewis says of himself, the rest of my experience that summer evening long ago seems cut off from me, though I can see it all quite clearly in the distance. The blood and Lady Macbeth remain. In that moment, however, I was ashamed of myself. I held this dying boy in my arms and all I could think of was Shakespeare? Now I know better. Now I know that it was the imaginative tool that was at hand. I just love how in these three posts Stephen C. Winter notes the difference of the fragrance of the athelas for each of the characters and builds upon it. Well done.